Everyone feels like they should be eating more kale, but when raw it’s a bit of a struggle sometimes. There are a number of recipes for kale salads where the instructions call for massaging each kale leaf with olive oil to wilt them and make them less tough. You can also serve it with a hot cooked grain, so that the heat of the grain wilts the kale somewhat, but leaves it with some texture so that it has presence in the dish. These kinds of grain dishes can be served hot, warm, room temperature, even cold. They are super portable, so make great lunches throughout the week. Try other grains, such as farro, barley, sorghum, or couscous. If you didn’t have the time or inclination to spread out the dressed grain salad on a baking sheet to finish cooling, you can skip the step. It just allows the quinoa to cool more evenly, and eliminates the possibility of the salad being a bit sticky or gummy. 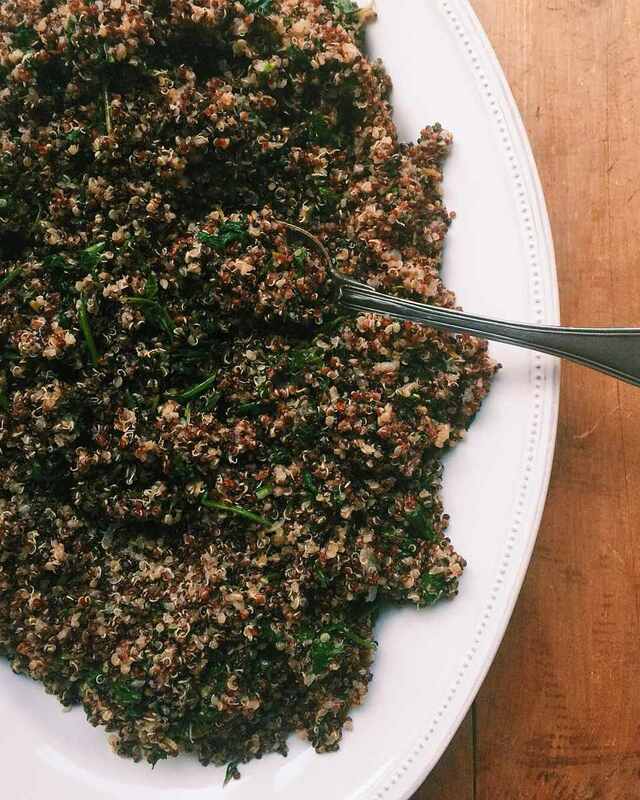 In a large bowl, or the pot that you cooked the quinoa in, mix the quinoa with the kale until well combined. Allow it to sit for about 3 minutes so the kale wilts a bit. In a small container mix the onion, olive oil, lemon juice, vinegar, Dijon mustard, garlic and salt and pepper. Pour the dressing over the quinoa mixture, and toss to blend well. If you have time, line a rimmed baking sheet with aluminum foil and spread out the quinoa salad so that it cools quickly and evenly. Serve in a bowl, at room temperature.